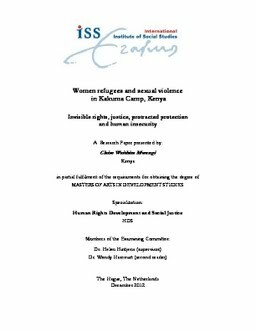 This paper will study the human rights violations of women refugees in Kakuma Camp in North-West Kenya. Given the high numbers of refugees in Kenya1 the question arises of what actions are being taken to promote implementation of the International Refugee Convention in line with formal international legal provisions.2 The specific focus in this study is on refugee women of Somali origin, aged between 18-59, and living in Kakuma Camp under extensive human rights violations that affect their well-being. The research will look specifically at the question of sexual violence against these women and how it is being addressed. For the study, over twenty interviews with refugee women and men, community leaders and NGO workers were carried out in the camp. UNHCR and other humanitarian agency reports on human insecurity and gender-based violence were also used to inform the study. To understand the problem of sexual violence against refugee women, and how it can be addressed, the study combined human security and human rights-based approaches, so as to be able to envision women’s well-being more holistically. The key findings included a high level of sexual violence cases among the women, partly due to high human insecurity, and the failure to protect the women in the camp. A ‘gap’ in human rights realisation was identified, and as an ‘intersectionality’ analysis of Somali refugee women’s position showed, cultural conditions of women need to be factored into humanitarian agencies’ efforts to address sexual violence. The hope is that this study can contribute to filling some gaps in the existing literature and research on women refugees, and sexual violence, from a human rights perspective.